If you plan on going Florida Keys backcountry fishing, you'll be out in the shallow water of Florida Bay and the Everglades National Park. This area covers roughly close to 1000 square miles and is west of Key Largo FL, and northwest of the rest of The Keys. This is the real Florida. Untouched, pristine and beautiful. If you have the time and energy, you can also discover not only 300 documented species of fish, but a vast variety of plant, bird and other Florida wildlife. 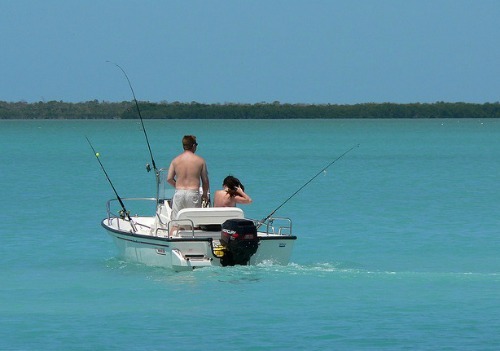 Florida Keys backcountry fishing is also an excellent choice for families, especially those traveling with children. The scenery and abundance of wildlife is incredible. The opportunity for catching Florida fish as well as capturing some terrific pictures is amazing. Plus you don't have to travel long distances, or worry about potentially bad Florida weather. You also don't have to deal with the rough water that you usually encounter when Florida Keys deep sea fishing in the Atlantic. In fact, it's virtually unheard of for anyone to get seasick when backcountry fishing. Since the backcountry covers a lot of territory and is home to such a vast species of Florida saltwater fish, this means you have a lot of options in where to fish, and what to fish for. Of course the central theme in all of this is to have a successful fishing trip. 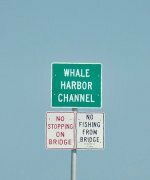 This means your best option is to plan on going out with a Florida Keys fishing guide for at least one day. Not only do they carry the necessary fishing license for you, they have the right fishing tackle and boat, and maybe more important, they possess the experience needed so your fishing trip is a memorable success. Arranged from Key Largo down to Key West are some of the more qualified backcountry fishing guides available to you through FishingBooker so you can easily and knowledgeably book a Florida Keys fishing vacation. FishingBooker makes choosing a charter incredibly easy as they have a vast variety of search criteria so you can drill down to exactly what you want. For this reason I've chosen to work with them as an affiliate. Also, so you're fully aware, as an affiliate of FishingBooker, if you click a link to a charter, book it and go on it, I stand to earn a small commission. The charter does not cost you any more if you book here or elsewhere because this is what being an "affiliate" means. Deep South Fishing Charters with a maximum cruising speed of 40 knots, can also float in 3 inches of water, making it possible for you to get out fast, and then hit the skinniest of waters in search of the wiliest fighting fish, like permit, redfish, snook and bonefish. The ability to pole this light boat quietly through the water or use a trolling motor in search of tarpon makes a fishing expedition with Deep South Fishing Charters exciting and productive. You'll find Captain Booth's combination of expertise and determined dedication to do what he can to make your fishing trip a success are just some of the reasons why his customers go home happy. Bamboo Charters 1 boats have a maximum cruising speed of 44 knots. Captain Bellinger is not only a highly accomplished Florida Keys fishing guide, he is also a PADI Master scuba diver and a highly trained and certified naturalist. These combinations bring an astounding level of knowledge to your fishing trip experience whether you're targeting tarpon, barracuda, shark, permit or cobia. You'll learn about the fish you're targeting, the marine and bird life you see on the water, and the importance of this water wonderland and it's connection to Everglades National Park and human lives. If you're eager to learn the best ways to catch fish, or sharpen your existing skills, plus are interested in understanding more about the natural Florida surrounding you, this is one Islamorada fishing charter trip you won't want to miss. Pirate For Hire Charters is a fast boat with a maximum cruising speed of 45 knots that's equipped with top notch fishing technology and equipment. Captain Ron, and his son not only have years of fishing experience, they're as passionate about what they do, as they are about ensuring you have the time of your life fishing with them. Whether you're targeting shark, barracuda, cobia, permit, bonefish or tarpon, the mighty silver king, they have the expertise and fishing equipment necessary so you can bring in the trophy fish you've been dreaming about. Papa Pip’s 29-ft. Topaz Express has a maximum cruising speed of 24 knots to get you out into the Atlantic or the Gulf of Mexico depending on what you're wanting to target on your Marathon fishing vacation. From snapper to cobia, wahoo to grouper, marlin to mahi mahi, you'll discover a true fishing adventure while you're aboard Papa Pip's well equipped Topaz. Captain Ruben's Charters boat has a maximum cruising speed of 30 knots. Providing customized backcountry and flats fishing trips, you can expect to target the best fighting fish in season, whether it's barracuda, permit, bonefish, tarpon, shark, or more. All fishing gear, bait, lures, drinking water, and licenses are provided. Capt. Mike Wilbur’s Chaser Key West has a maximum cruising speed of 35 knots. With over 20 years experience and recognized several times as the Best Guide Service in Key West you'll enjoy your Key West fishing trip, Gulf or oceanside for bonefish, tarpon, permit, jack crevalle, and other backcountry fighters. Boat is equipped with essential gear and includes both spin and flycasting equipment. Florida Keys backcountry fishing often entails going out with one of the many qualified Florida Keys fishing guides, in one of their specially designed boats. The water in the backcountry is not very deep, and so these boats are built with shallow drafts, and are typically a comfortable 16' - 20' in length. The skiffs usually have a platform so the Captain has a good view of the area and can easily spot fish while poling around. When Florida Keys backcountry fishing, poling is often the preferred method of plying these waters. This allows the skiff to quietly slip through the water without scaring off the Florida fish swimming mere inches below the boat. Using a pole also makes it easy to navigate around grass, stumps and other sub-surface obstructions which are good feeding and hiding spots for game fish like snook and cobia. The calmer, shallow water can range in depth from a few inches to about 6 - 7 feet, a bit deeper in pockets. However, just because the water's shallow doesn't mean you're not going to have a strong selection of Florida fish, both in variety and temperament. When Florida Keys backcountry fishing, you'll find permit, snapper, cobia, bonefish, sea trout, grouper, hogfish, redfish, shark, snook, and of course the mighty Silver King or tarpon. Not only is there great selection, but the fish can be particularly entertaining. Perhaps it's the shallow depths that makes them more skittish and wary. When Everglades backcountry fishing, no matter what fish you target, or how big or small they are, you'll find that they'll leave you with a major adrenalin rush. The Florida Keys sport fishing enthusiast has a number of backcountry fishing options to choose from. You can flyfish - which is especially popular for catching the challenging bonefish in the flats, or you can use spinning or casting rods. However, you'll find that spinning rods are easier to make accurate casts, especially when using lighter weight tackle. Unless you're planning on battling it out with the big boys like tarpon, grouper and shark, you can also get away with much lighter tackle. This is because you're fishing shallow and many of the Florida Keys fish you'll be targeting can be brought in using lighter weight gear. This also makes the sport more exciting as lighter tackle lets you feel all the action. When you're out in the backcountry you should also plan on spending some time Florida Keys flats fishing. This is where you'll take the ultimate challenge and test your skill against some of the wariest opponents such as bonefish and permit who love to feed on the flats. Regardless of age, or skill level, a day spent out on Florida Bay or the Everglades backcountry will be prove to be one of the best times you've ever had. It'll keep you coming back for more, and each time you'll add another exciting and true tale to tell your friends back home.